French mathematician; born at Paris in 1831; died there Jan. 5, 1877. He entered in 1831 the Ecole Polytechnique and was graduated lieutenant of marine, but resigned in 1833 and devoted himself to teaching. Involved in the events of 1848, he was connected editorially with the "Journal des Travailleurs," and was appointed vice-president of the commission of Luxembourg. Blum was arrested for having taken part in the publication of an injurious libel addressed to the president of the Assemblée Constituante, but was soon released. He then took up his scientific occupation. 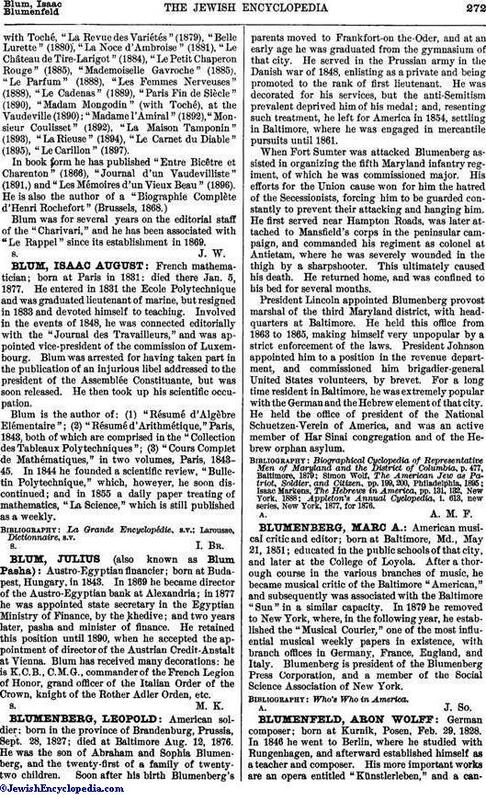 Blum is the author of: (1) "Résumé d'Algèbre Elémentaire"; (2) "Résumé d'Arithmétique," Paris, 1843, both of which are comprised in the "Collection des Tableaux Polytechniques"; (3) "Cours Complet de Mathématiques," in two volumes, Paris, 1843-45. In 1844 he founded a scientific review, "Bulletin Polytechnique," which, however, he soon discontinued; and in 1855 a daily paper treating of mathematics, "La Science," which is still published as a weekly.